by Berg, Danita; May, Lori A. For decades theorists have opined that the lines between creative writing and composition need to be lifted, yet little has been written about the pedagogical methods that allow a cohesive approach between the disciplines. 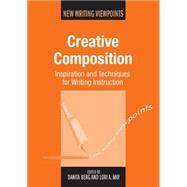 This book brings together contemporary authors and well-respected creative writing instructors and theorists to explore ways creativity in composition may be encouraged in student writers. The question in this anthology is not ‘Can writing be taught?' but ‘How can we inspire students to embrace the creative process no matter what they write?' This book offers multiple strategies to merge the best practices of teaching writing, regardless of the genre.